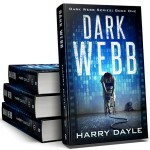 My most recent novel, Dark Webb, is now in general distribution. After a short period of exclusivity with Amazon, the ebook edition is available from all the major ebook platforms from today. The print edition continues to be available from all good book stores as well. On the subject of the Dark Webb series, I recently finished writing the second book. There’s a lot of work to be done before it will be ready for publication, but we are tentatively looking at September for that one to hit the stores. So if you haven’t read Dark Webb yet, this summer is the perfect opportunity to catch up!